A few summers ago, I was at Anvil in Houston, and tried the amazing Rooster Cogburn Cocktail. It was right around when the Coen brothers' film came out, so it was fitting. If you're wondering, Rooster Cogburn is the main character in True Grit. So I recreated it, using Steen's syrup and everything, but I wanted to try it again, and we threw out our Steen's syrup when we moved to our new house, so I had to do something differently. Here's the updated recipe, so you can try it yourself without having to purchase Steen's cane syrup. My wife actually bought the Steen's to put over pancakes, but it was gross. 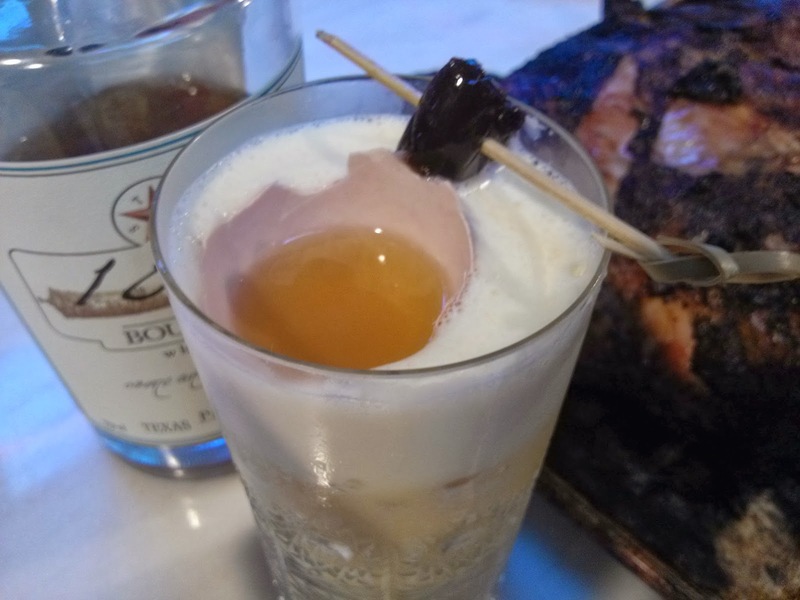 We didn't use it again until I made the Rooster Cogburn Cocktail. So I don't recommend buying any. If you're wondering, that's a slow-grilled javelina leg on the right. A southern cocktail seemed fitting. Because it has the whole egg in it, you need to dry shake it first. In fact, when the Anvil bartender made it for me, I asked her if she hated making the drink and she admitted that she had a love/hate relationship with it. Yes, you have to shake it a long, long time to completely emulsify the egg. Then put ice in it, and shake it again to get it cold and frothy. Strain and pour into a chilled Collins glass. And now for the fun part. Take the egg shell half and wash it. Then pour it full of bourbon and put it on top of the drink next to the homemade bourbon cherry. It's like a sour, even though there's no lemon in it. Bright, silky, and yummy. Make it like any simple syrup. Use a 1:1 ratio of sugar to water. So if you want a cup, use one cup of brown sugar and one cup of water. Heat it in a saucepan, or even in the microwave, just hot enough for the sugar to dissolve. Will last a while in the fridge.